SmartSoft Invoices has a built in e-mail import feature which allows the user to import documents directly from their mail inbox. SmartSoft invoices automatically logs into an email account and downloads all supported attached documents into an output directory. Currently this feature supports only IMAP mail servers, please make sure that your server supports IMAP. You have to fill-in required information - mail server, user, password and output folder. After you click OK or APPLY the software will try to connect with your mail server. If unsuccessful SmartSoft Invoices will show an error message. 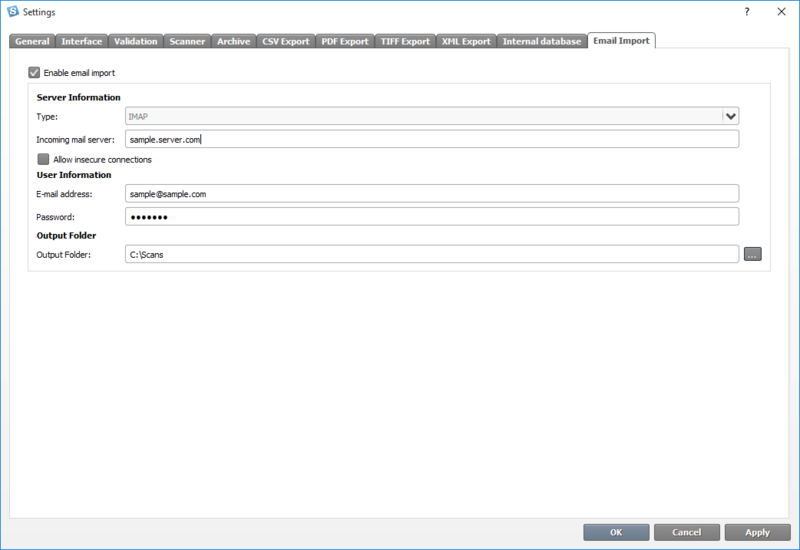 SSI will automatically download and import the received files from your Inbox for processing. Note: Be sure that the connection from application is enabled for your account, if your server forbids it. The speed and quality of invoice processing is greatly affected by the quality of the documents.